He's a 35-year-old husband and father who grew up in a small suburb of Worcester. Prescription drugs led to heroin. "I was doing dope every day." She is a wife and mother, who got hooked on vicodin after surgery. "I was just sick and tired of spending my money on drugs. I wanted to be clean," he told Team 5 Investigates. But that changed when their doctors prescribed buprenorphine, also known as suboxone. "It got me clean for the first time in 10 years so they work, if you take them the correct way," he said. "I was getting my life back," the mother said. The little orange pill has been called a miracle drug by many medical experts. Suboxone is a safer way than methadone to treat heroin and painkiller addicts. 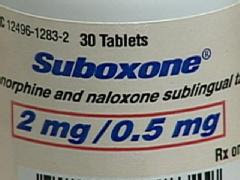 Unlike methadone, a doctor prescribes suboxone. "It prevents people from feeling withdrawal and it also gets rid of the craving," said Dr. Dan Alford, an opioid specialist with the Boston University Medical Center. Suboxone is the only opioid for which doctors need special training and certification before they can prescribe it. Alford estimates that only 2 percent of physicians in the country, and in Massachusetts who are eligible to get the certification, actually do. "Physicians aren't motivated to take this on, to embrace this," Alford said. Patients prescribed suboxone sometimes get multiple refills, and often get little medical supervision. Only a small dose is needed, so some recovering addicts trade pills for heroin or OxyContin, or sell suboxone for between $5 and $15 per pill. A recovering addict who declined to let Team 5 Investigates use his name said, "If you are getting a prescription of 120 and selling 90 of them, that's $900." Team 5 investigates spent a day riding along with Tim O'Connor of the Worcester Police Vice Squad, and saw the problem firsthand. "Those are his pills, he's just selling them," said O'Connor. He added that suboxone is starting to surface in nearly every drug bust. A man who worked with police during a recent sting told Team 5 Investigates, "I walked to the first corner, looked around and asked for 'boxone. One guy had crack, one had dope, the other had suboxone." Suboxone was never meant to be a street drug. In fact, it's the centerpiece of a multimillion-dollar government effort to shift the treatment of opiate addiction away from methadone clinics to private doctors' offices. Even suboxone's manufacturer, Reckitt Benckiser Pharmaceuticals, uncovered disturbing trends in a report sent to the FDA earlier this year, including evidence of lax or inappropriate prescription by doctors. At a drug treatment center in Lynn, Mass., the report noted that a third of drug abusers said they used "bupe" to get high. More than a quarter of suboxone exposures involved children younger than 6 who found and ingested the drug in their homes. And, when mixed with other drugs, suboxone can be fatal. There have been 15 reported deaths since 2005. Experts say the promise of suboxone treatment is tremendous when it's dispensed and supervised properly. But the great concern is, like the widely abused painkiller OxyContin, it is too often ending up in the wrong hands. "I think similar to what happened with OxyContin, where there was a perception among the youth that it was safe, that it is a prescription medication, it's safe, so that is a concern," said Alford. "The solution is not clear to me."